My Buddha is pink: Who will watch the watchers? A recent story in the Chicago Tribune has rightly outraged many. The specter of clergy sexually abusing minors has revealed itself in the Sangha, as well as the pernicious practice of enabling the monk perpetrators through “sending them away” to places where they wind up re-offending. The sad thing, in my mind, is that you could substitute “priest” wherever you see “monk” and “Catholic Church” for the temple’s cited. It’s the same enabling behavior: rather than directly dealing with the offender, he is shuffled off to re-offend. But don’t get carried away with that analogy. Our reactions to this story, which by the way is not “new” because even this specific event has been developing for more than a decade, reflect both our bewilderment and our anger. But while for many of us our initial reaction is to “rage against the machine,” where does it get us? Is that our best response? It is easy to see parallels in this situation, which I repeat is nothing new, with what’s happened in the Catholic Church. Both have traditions in which the clergy take vows of celibacy and both are dealing inappropriately with violations of that vow through secrecy and shuffling clergy around. But the similarity ends there. The Catholic Church is a world-wide organization with a central authority. Its entire administrative structure is based upon this authority, and while the Vatican moves agonizingly slow, it is an authority to which congregants can turn to petition or seek to influence. There is a dearth of similar administrative structures or hierarchies for Buddhism in America, and with Theravada, there are none. This is not a “Theravada” problem as it is not an institutional problem. Theravada, or the way of the elders, is not broken. Theravada is no more broken than Zen is broken, the latter of which has also seen its share of sexual misconduct among its clergy. To say that there is a problem within Theravada that needs to be addressed is no different from the one made by the editors of “Buddhist Warfare,” that Buddhism has a problem with violence. There is a problem, yes, but not with Theravada per se. With the Catholic Church, it is an institutional problem because the failure of appropriate response lies within the institutional hierarchy of the Roman Catholic Church. But there is no “institution” of Theravada. All the individual congregations have their own boards that answer to no higher authority. Proclamations of “Theravada, fix yourself” are specious and meaningless. Whose problem is it then? Because clearly this is a problem that requires our attention. While I knew how I felt, I didn’t know how to respond. So I asked four monks who reside both in the U.S. and Southeast Asia. What can a layperson do? Are there oversight organizations that can be pressured? Reasoned with? While I have not heard back from all of them, the responses I did receive were simultaneously unsurprising and vexing. It goes back to the culture issue: many of these congregations are based upon an ethnic community that doesn’t have the same tradition of openness and confrontation that we have in America in particular and in the West in general. And the other issue is what ecumenical or administrative organization is there that exists to exert pressure on? When you’re angry, who do you shout at? Who has authority over these sanghas? Shravasti Dhammika replied, in part, to my query with the following: "I have long been an advocate of the idea that ultimately, to move ahead, Western Buddhists will have to gently and politely ‘part company’ from traditional Asian Buddhism. The values, assumptions and attitudes of the two are just too different...We Westerners have enough problems of our own, getting involved in ethnic Buddhists’ wastes energy, leads to resentment and changes nothing. Let’s walk our own path." While I do not subscribe to the notion of Hinayana – the Lesser Vehicle – when describing Theravada or the Thai Forest Tradition, the way it is manifested, the practices that it adheres too, certainly make it come off as a teeny-weeny wagon mired in twisted and misogynistic doctrine. And after viewing the vibrant and at times acrimonious discussion at Sujato’s blog regarding secular Buddhism versus traditional practices, I am increasingly of the mind that Buddhism in America needs a Reformation of its own. This is an important question for American and other Western Buddhists as more and more Westerners adopt Buddhism while at the same time its various iterations are increasingly co-existing literally closer to each other: Thai and Cambodian Theravada temples within blocks of Tibetan meditation centers that are close to Zen groups operating in store fronts and SGI groups meeting informally in homes in many neighborhoods. No longer are the various schools and vehicles physically separated by countries or other much larger geographic divisions. For crying out loud, I bet 90 percent of the non-Buddhist world thinks that the Dalai Lama is the leader of all Buddhists! Many of us may rebel against the idea of a “centralized” Buddhist structure that oversees congregations and establishes parameters, and there is merit in their worry. 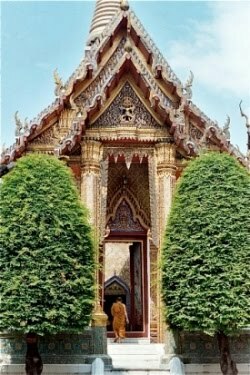 But if Buddhism is allowed to gradually erode into a populist practice in which anyone who writes anything and gets it published is suddenly a guru who doesn’t know or care a whit about Dhamma, then we all might was well start dropping acid right now and walk the road of hedonism and nihilism, because that’s where such a road leads. Conversely, Buddhism cannot be and never really was a fixed doctrine. Frankly, most of the Vinaya the Buddha made up as he went along, reacting to certain situations that arose at the time. Now that the Buddha’s gone, however, the Vinaya and Tipitika are treated like some sacrosanct text that cannot be changed and even contemplating a review of it would be considered heresy. Yet it is this blind allegiance to doctrine that gives us a Thai Forest Tradition that can’t come to grips with ordaining women, a Zen culture in which the teacher is considered infallible, a Mahayana sentiment filled with bodhisattvas that can’t pay their own bills but they’re gonna save every sentient being, and a Tibetan culture that deifies superstition. Things have changed in the monastic community and many of us may not be aware of that. Arun from Angry Asian Buddhist reminded me of an excellent point. In the past, families in Asia sent their children to the Sangha for education, but nowadays, education has been largely secularized. Trips to the Sangha are less frequent. In fact, it is losing support in some regions. Add to this the growing desire and pressure to succeed in life, to get a professional degree; in the past those motivated to learn, think abstractedly and were of high intelligence were attracted to the monastic tradition, but has that attraction disappeared? And if so, how is that affecting the quality of those who do enter the Sangha to seek ordination? If all the smart and ambitious ones are going to graduate school, what does that leave for the Sagha in terms of new recruits? Granted, the Sangha has done great things for young men who made poor decisions, drank excessively, gambled, used drugs, etc. But some of these men are also being ordained and sent off to the U.S. to guide their own community of immigrants and do so on their own without guidance or support. These young men are placed in positions of authority to watch over a devout and, most likely, naïve congregation. In the meantime, young women and boys are preyed upon by those whom they thought they could trust. Perhaps it is time that Buddhism in America takes a look at how physicians are managed. Medical doctors who received their degree overseas, but who desire to practice in the U.S., are treated just like residency students and required to go through a residency program before being licensed here. I know two medical doctors, one who received his degree in the Philippines and the other who received his degree in Taiwan. Both are licensed physicians in their home country, but for them to practice in the U.S. they must go through a residency program here just like someone fresh out of an American medical school. But someone trained to be a Buddhist cleric and ordained in Thailand, Nepal, Japan, or anywhere else can come here and start a congregation with virtually no oversight. Maybe that needs to change. Yes, there is no oversight for teachers trained anywhere. There are those who take the label teacher with little or no training at all. There are those who claim to have downloaded a tulku as their authority and gain quite a following despite being denounced by the school they purport to represent. There are those who are signed, sealed and delivered who can't seem to manage themselves either. The problem isn't with Buddha or Dharma but with Sangha. I do note that a lot of Sangha problems get sidestepped by blaming the other two though. It tends to descend into something like, "Buddha wasn't real! ", "Was too! ", "Was not!" The fault is not in our stars but in ourselves. That's the point of departure if we want to resolve these issues. But it requires a willingness. We could set up registration bodies and the like but the complexity would be daunting as would the bureaucracy involved. Would there be inspectors who would go around and check up on things? How would their biases be accounted for? Would there be a checklist of approved procedures and beliefs that everyone would have to follow? Even in terms of behavior that would be hard to universalize with some who choose celibacy and some who don't? I wouldn't want to be the one who had to handle that checklist. At least not without gloves on. Sanghas have got to step up and speak up. Incoming monks should have to go through a background check. Put it in the bylaws. That saves everybody's face. When it becomes that official people won't feel so intimidated that they are disrespecting clergy. It's way easier to say, "It's in the regulations." than "I question your motivation and actions." It's depersonalized and bureaucratic. And everyone understands bureaucracy whether they are born in America or Asia. It would be nice if there were a Better Buddhist Bureau we could all register our complaints to and check the history of people but that's an enormous undertaking and also easily bypassed by name changes, false declarations and so forth. It's got to start at grassroots to influence boards in America. It seems not so easy if the state is involved as it is in Sri Lanka or Thailand. But then again the devout there are also voters so perhaps grassroots is applicable as well. The most important thing though is for practitioners to make noise;to write about it, ask questions, make suggestions, talk to others. I read an article recently that said public opinion is swayed by as little as 10% holding a position firmly. That's the tipping point. It seems a lot less daunting to convince 10% than to convince 51%. I think a lot of people get discouraged when faced with 51%. Seems like a lot. Momentum is the key. Very thought provoking. I have lately been entranced by "Buddhist psychology" and trying to apply it where I work in the prisons. I also realize that I have been over-idealizing. There needs to be some kind of oversight. @NellaLou, yes an oversight board would be a challenge, and it likely could not have statutory authority. But it could work like some oversight groups in the medical community, like the JCHA. As to vehicle bias, why not have a body that has a Theravada division, a Zen division, and Pure Land division, etc. so that people aligned with a particular doctrine are the ones overseeing that doctrine. There are a lot of ways to skin a cat, pardon the metaphor. Than you @Instanthuman, I hope to provoke some discussion that may actually lead to something! @NellaLou, to clarify, what I mean is have one central body that has subdivisions for the various vehicles and schools. Oh I have many ideas about this. Getting all the various branches of Buddhism to agree to being part of a single "regulatory" body, even with subsections, is pretty unlikely anytime soon. Perhaps it's more possible for something like this to develop in the opposite way. One group builds such an oversight body, and then others see how it's working and copy. And then there's a realization at some point that linking together offers even more benefits, which leads to a group effort amongst the various schools. I think Buddha was pretty aware of how dicey sangha can be, and obviously all the rules for the original sangha just kept piling up as monks committed dimwitted, and/or destructive actions. So, it's a really old issue as you know, and one major thing working against us is - us. Hi Nathan! I agree that trying to pull all existing groups under such an umbrella may well be impossible. I was really thinking in terms of a hybrid of what you suggest, which is a great idea. But if a central body was created and then it would play a role in the development and expansion of new sanghas, eventually leading to a point where it would begin to attract existing sanghas to voluntarily fall under the larger umbrella. Either that, or they copy the format for themselves, which is fine, because the goal is transparent and consistent oversight.